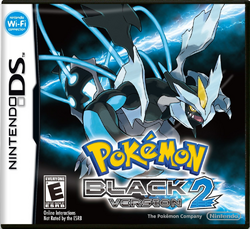 Pokémon Black and White 2 (ポケットモンスター ブラック2・ホワイト2, Poketto Monsutā burakku 2 howaito 2?, "Pocket Monsters: Black 2 & White 2") are the second paired games of the fifth generation of Pokémon role-playing games. They are sequels to Pokémon Black and White, breaking the pattern set by Pokémon Yellow, Crystal, Emerald and Platinum. The games were developed by Game Freak, and published by Nintendo, for the Nintendo DS. They were released on June 23, 2012 in Japan, October 7 in North America, October 11 in Australia and October 12 in Europe. The games feature two new forms of Kyurem that serve as the version mascots of the games: Black Kyurem for Black 2 and White Kyurem for White 2. "Two powers combine...A new legend arises! Set off on a new Pokémon adventure to save the Unova region! You and your Pokémon can accomplish anything together!" Pokémon Black and White 2 take place two years after Black and White. They include many new features such as new locations and characters. There are 300 Pokémon to be found in Unova, all of which have their own strengths and weaknesses. Your goal is to journey across the Unova region with your Pokémon and collect all eight Gym badges. Doing so, you'll be able to challenge the Elite Four and Champion. Along the way, you'll encounter the evil Team Plasma, who want to take over the Unova region and must be stopped. You'll also meet up with several other characters, such as Hugh, your rival, Colress, a Pokémon researcher who wants to draw out the strength of Pokémon, and Cheren and Bianca, the rivals from Black and White, who assist you on your journey. Box artwork for Pokémon White Version 2. This page was last edited on 2 October 2013, at 16:35.